Atlantic Avenue is our Downtown’s main thorough-fare running from the interstate to the Atlantic Ocean. Here you will find restaurants (93% of them independent), retail stores, small businesses, hotels, parks, and cultural venues. 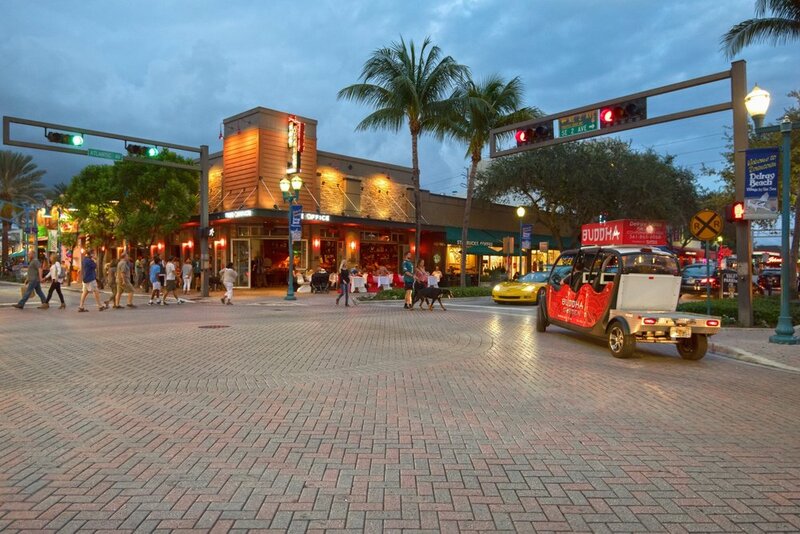 The walkability of our Downtown is what makes it a desirable place to visit or live. It is extremely pedestrian-friendly, and we have great modes of public transportation including a Downtown Roundabout Trolley & free on-demand golf cart service. We are currently in the process of expanding those services and creating more eco-friendly ways for our residents and visitors to get to and around our Downtown. We have been named an All-America City 3 times (last in 2017), a Best Small City to Start a Business in, a Most Fun Small Town in America, a Top 10 Honeymoon Destination, a Top 10 Beach Destination, and hopefully soon Strongest Town of 2019! The Delray Beach Children’s Garden is located right in the heart of Downtown Delray Beach. It was created by the community to nurture eco-consciousness in children. It’s important for our community to teach sustainable methods to the next generation to ensure that Delray Beach remains a community-centric, locally-producing, self-sustaining town. We have 3 other community gardens in the Downtown area, a permanent local farmer’s market that carries fresh produce from nearby farms, a pop-up green market every Saturday, and several local non-profits geared towards a collaborative, maintainable future. Seeing as our beach is one of the main draws for visitors & residents, our city saw the need to update the sidewalks that run north and south along the coastal road of A1A. Our beach master plan included wider sidewalks for pedestrian safety and ease of use, designated bike lanes along the side of the street, updated pavilions for shade and a place to rest, bike racks, surf board racks, outdoor showers (both full body and just for the feet), water fountains for both our humans and our pets, and pet refusal bins to keep the area sanitary and clean. 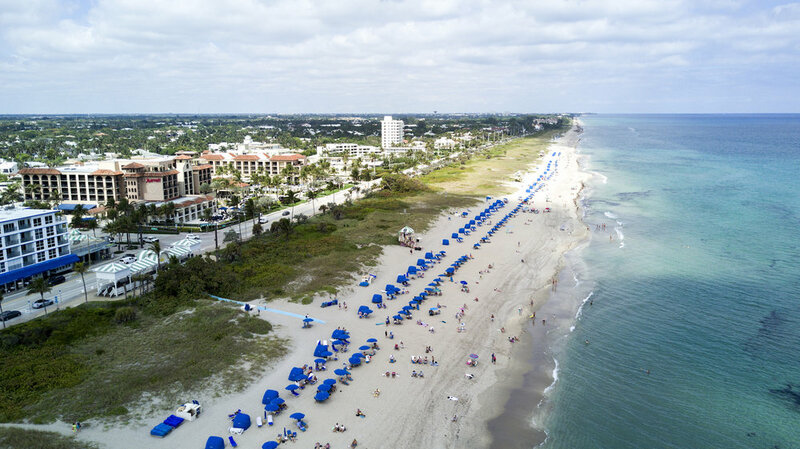 Our beaches are completely free to the public, and the beach master plan enhanced the usability of our beaches and the welcoming environment! You won’t see any development on our beachfront as the land was deeded to the city by the Gleason Family in the early 1900’s. It will always be available to the public, and no development is to take place along the two-mile stretch. We are a small business-minded community with about 93% of our businesses being locally owned and about 97% of our businesses employing 20 people or less. We are hyper-focused on maintaining that locally-owned and operated feel in our Downtown as we feel it adds to the overall charm of our town. We have a multitude of programs through our Chamber, Office of Economic Development, and Downtown Development Authority that offer support and resources to our businesses. In order to maintain the economic vitality of our town, we work with our partners to find the right businesses that can grow and succeed here. We are neighborhood champions for AMEX’s Small Business Saturday, we partake in I Small Biz month, and we hold monthly merchant meetings to help our business community flourish. The Colony Hotel is our oldest standing hotel, right in the heart of Downtown Delray Beach. Owned and operated by the same family since 1935, the Colony Hotel is sustainable, green, eco-friendly, pet-friendly, and a true authentic historical gem. The Colony Hotel hosts a myriad of local events including our award-winning Fashion Week. It houses a yoga studio that offers classes throughout the week and live-music classes on the weekend—these classes are open to both hotel guests and the public! It also houses small businesses in its several storefronts. 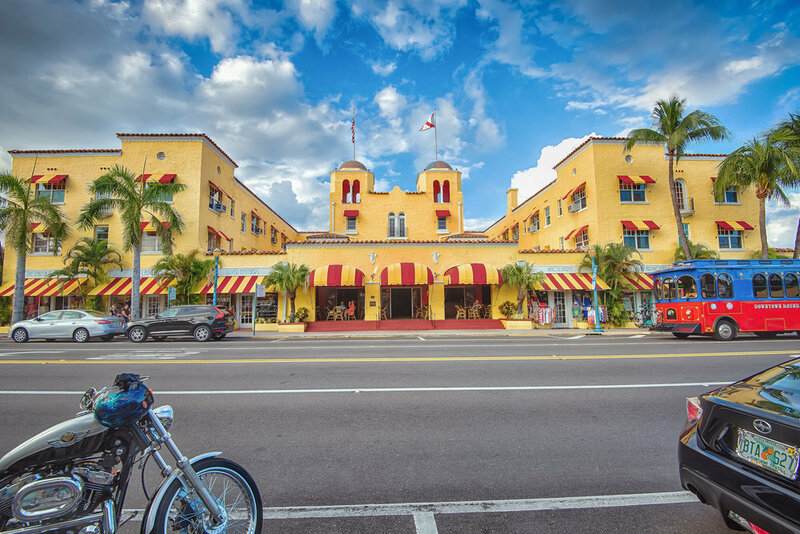 The Colony Hotel is a great example of how Delray Beach is maintaining its historical roots while continuing to grow and develop. It reminds us of our humble beginnings as a small village to where we are today—a world renowned resort town. One of the examples that very much fits the Strong Town philosophy is instead of sprawl, looking at infill. In the city of Pensacola, there was three acres that had an older, one story building on it that was home to the local newspaper and their parking lot. This land was purchased, the newspaper relocated downtown, and in this old building’s place a new sixteen million-dollar YMCA building, a fourteen-million-dollar mixed use office building, and a fifty-two-million-dollar apartment facility with 258 apartments. There is also a street in between the YMCA and the apartment building called a Woonerf—which means “living street”—to slow down traffic and promote walkability. The apartment building is what is pictured here. This is an example of flat land, formerly contributing only seventy thousand dollars in property tax, that now pays over half a million dollars—all while not creating any new roads, piping, or wiring. The private sector here in Pensacola loves the city and continues to work with the public sector to find ways to continue to our goal of making Pensacola a great place to live, work, shop and play. One of the impacts the private sector has made is CivicCon. Different speakers who specialize in various areas of urban planning come to educate and inform the citizens of Pensacola. 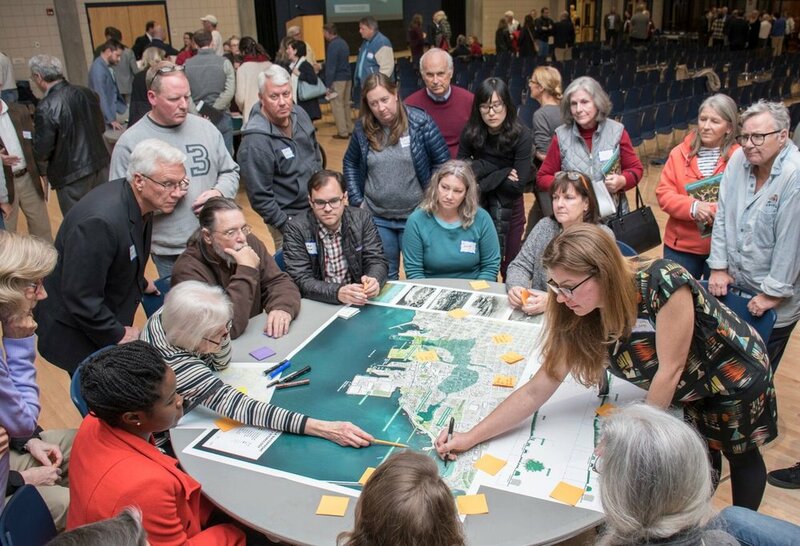 Pictured above is the work being done on Pensacola’s Waterfront Resiliency, which is being funded in part by the public and private sector of Pensacola, that began from a CivicCon speaker. In Pensacola we are very proud of our focus on building small businesses. 60-80% of job creation here happens organically. One example of how Pensacola views helping small businesses as a priority is the local Institute. The Institute hosts twenty different training programs each year, varying from a variety of topics that many people can relate to from a start-up to an established business and from a new employee to the owner. There are also Small Business Roundtables, which provide a space for business owners to gain advice and meet/network with their peers. Finally, it also holds a conference called EntreCon that focuses on leadership and professional development. Pictured here is one of the Institute’s trainings. Here in Pensacola, we have worked to create a culture that is ripe for entrepreneurship. 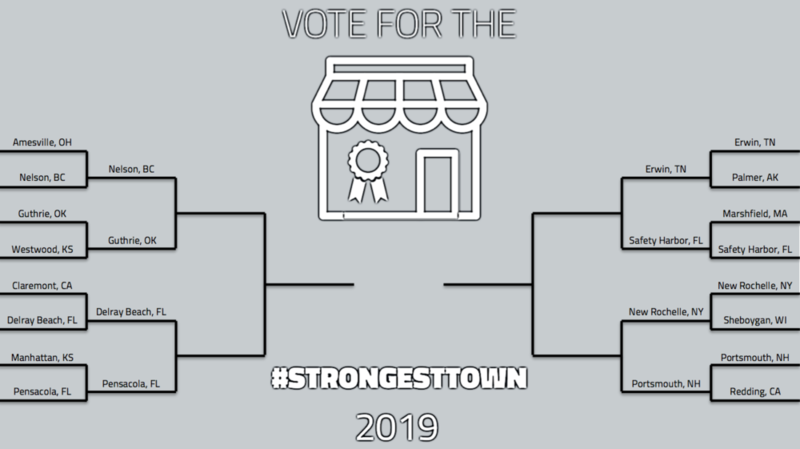 Following the Strong Towns philosophy, our city works to not spend money on incentives, but rather on companies that are already here. Our city has the goal to become a thriving environment for new startups. We have taken several steps to do this such as with the institute’s trainings, conferences, and roundtables. This rich culture has created a place for entrepreneurship to thrive. Here you see a photo of the product of this entrepreneurship. This is the interior of a bar called World of Beer. This building had previously been a military uniform shop. A local entrepreneur purchased the location and opened this bar. After the success of this business, the entrepreneur has purchased the surrounding store fronts and started a taco shop, pizza restaurant, and mixed drink bar. The street you are looking at is Palafox Street. It is the center of downtown life here in Pensacola. In the past four or five years, the investments in the downtown community have gone up 60%. Downtown has become a place where programming happens daily, and business thrive. The city has seen a 5.3% increase in population. Additionally, Pensacola has managed to increase the assessed property value from $675 million to $918 million, an increase of 36%.